Women’s feminine area is biologically designed to be self-cleaning, this is done so by the help of our natural secretions or discharges. But as women accumulate age, hormonal changes also occur and have significant effect on the physical make-up of a woman’s body especially in the intimate area. And because of this, we, the stronger species, feel that we should do something more to keep us cleaner and cooler. For most women who are culturally used to being clean with their bodies, this goes without saying that more decisively it should be cleaner ‘down there’. But under normal condition, our OB-GYNE would tell us to just use warm water to clean our feminine part. I actually do that too. But it has significantly become an everyday habit to go beyond just warm water, especially when we have our period. We want to smell extravagantly flowery by using commercially available intimate wash. But choosing the right brand can be confusing especially that there are hundreds of brands lining the shelves these days. My doctor always recommend to choose products that are pH balanced, so that in the process it won't dry up the delicate skin 'down there'. 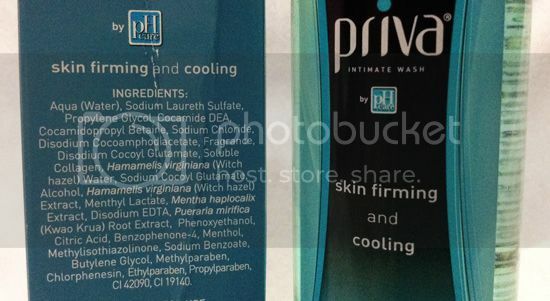 And speaking of intimate wash, United Laboratories, Inc. the maker of Priva has sent me two full-size samples of this intimate wash for review. And today, I'd like to share my experience with you. I'd like to be honest that whitening the brown areas 'down there' cannot be achieved in using just a single bottle or two of Priva. Maybe with continued use, in which I yet have to do and I'll update you ladies with the development in the nearest future. 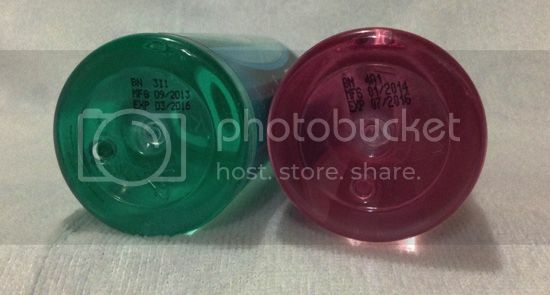 The Whitening variant has a classic floral scent. The liquid has medium consistency which is good as it won’t spill fast from your hand. It lathers decently and has a delicate after-feel which I really like. 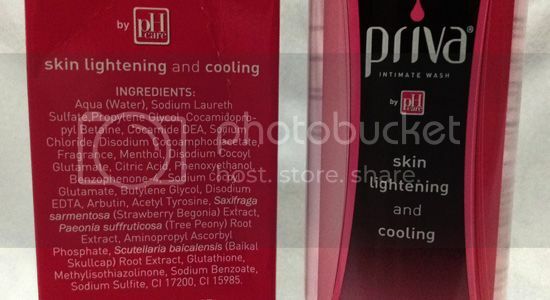 But the winning feature of this product that made me so convinced that this is definitely the intimate wash ideal for women 40 and above is the added RevitaCool. This keeps you refreshed and cool after wash. It’s soothing and indeed refreshing. If you're experiencing early signs of menopause and or battling hot flashes in this stage of your life right now and you're looking for products that will help you provide immediate cooling relief, then this is the right thing for you. Priva Skin Firming and Cooling. The Firming variant is liquid turquoise in color and has same liquid consistency as the Whitening. I love the scent of this better than the other. It smells like pads of scented stationeries I used to collect back in high school - sweet and flowery. The scent lingers long even after you’ve changed. If you have partners, those guys will love you more for this. It leaves a cool, clean and delicate after-feel – it's invigorating. On the firming part, again, just a bottle won’t suffice to achieve the firming result, I yet have to replenish my current bottle and see if it really delivers. This contains natural extracts of Kwao Krua, an herbal root found in Thailand that is known to help improve skin elasticity and firmness, hence, with continued use I’m positive this will yield results. I personally approve of these products, both didn’t give me itchiness and after-use discomfort. I suppose so as these products are clinically tested by Obstetrician-Gynecologists and are guaranteed to be safe and recommended for everyday use. The only thing I don’t approve on both is the inconvenience of the hard container. It could have been easier to squeeze out the content had it been bottled in an easy-squeeze container. But design wise, it’s elegant. So, ladies 40 and above, I’m sure as the cooling effect of this product, that this intimate wash was formulated with your needs in mind. So pick one for yourself today and try it out! Priva is available in all leading supermarkets and drugstores nationwide with P20 off the regular price from June 1 to July 31, 2014.